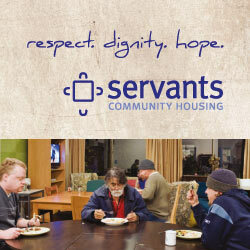 Servants Community Housing is a company limited by guarantee, a charity, public benevolent institution and a registered housing provider. The management of the organisation reports regularly (at least 5 times per year) to a board of volunteers. In turn, the board reports to the members of the company at the annual general meeting (AGM). Below is a link to the profile of the current board members. We have two subcommittees that meet as required. Below are links to their charters and their membership. Risk & Audit committee charter – Members: Michael Heaton (chair) Warren Clark, Donald Speagle Management present: Amanda Donohoe, Madeline Tucker. Nominations committee Charter – Members: James Gaynor(chair), Warren Clark. The relief of poverty, sickness or the needs of the aged by providing affordable rental housing to persons in housing need as low-income households, or through infirmity or age. To promote other purposes beneficial to the community through the provision of affordable housing and associated services. do all things that are necessary or incidental to furthering the above objects. To apply for membership of the association fill in following form and return it to secretary@servants.org.au (note: you will need two existing members to support your nomination). The Victorian Housing Registrar (Department of Treasury and Finance) regulates Servants as a Registered Housing Provider. Consumer Affairs Victoria (CAV) regulate Servants as a Fundraiser. They also regulate us a rooming house landlord through the Residential Tenancies Act. Australian Charities and Not for profit Commission (ACNC) regulate Servants as a Charity and as a Public Benevolent Institution (PBI). Australian Securities and Investments Commission (ASIC) regulate Servants as a company limited by guarantee. The Australian Tax Office regulates our Deductable Gift Recipient (DGR) status. Check back regularly as we continue to update this page. Servants welcomes volunteer, financial and prayer support. It’s what keeps us going. So if you have a passion for serving and supporting those who are marginalised, then please complete this form and we’ll be in touch. Of course, we respect your privacy and won't share your details with anyone else.